» Musical Presence: The Sounds of Music, or the Sounds of Sound? Musical Presence: The Sounds of Music, or the Sounds of Sound? Comment : Comments Off on Musical Presence: The Sounds of Music, or the Sounds of Sound? Edmund Mendelssohn leads Berkeley Connect students through a discussion on musical presence. Beethoven’s Fifth Symphony begins with four notes that create a burst of intensity, one that never seems to end. Through the entire piece, these four notes are iterated upon, weaving each movement into the next. These notes transcend time and space, re-appearing in modern music and movie scores. Berkeley Connect Music students endeavored to unpack the weight of Beethoven’s symphony and other pieces from the musical canon as they tackled the notion of musical presence. According to their graduate student mentor Edmund Mendelssohn, musical presence refers to a reckoning with musical meaning. It can be the sounds and rests that establish a composition in the canon, or the everyday noises around us. Beethoven’s 5th is carefully crafted, evoking sensations of anxiety, anticipation, and excitement. But as Edmund shared his dissertation topic, Berkeley Connect students learned that musical presence is not limited to epic performances. Whereas Symphony No. 5 is full of movement and noise, John Cage’s composition 4’33” begins with a rest; it ends with a rest. In fact, the entire piece is comprised of silence, at least on the part of the performing musician. The 4’33” piece contrasts with Beethoven’s symphony, striking the listener with not pounding but foreboding emptiness. 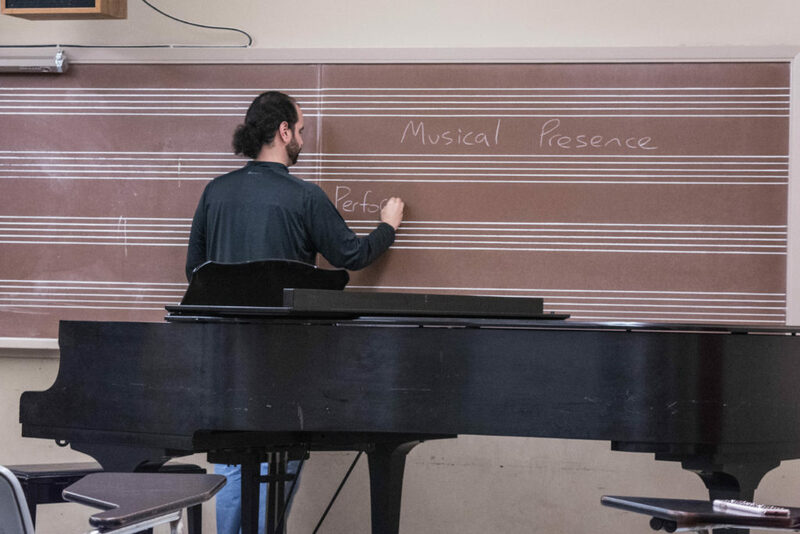 Presented with these two notions of music, Berkeley Connect students tried to understand the different readings of a piece. E.T.A. Hoffman, for example, commended Beethoven’s symphony as conveying a story and theme. Cage’s piece, in comparison, challenged conventional notions of music, asking the listener to test and redefine their understanding of sound and beauty. Considering the two pieces, Symphony No. 5 and 4’33”, Edmund opened up the discussion to assess the state of contemporary music. Today, with the introduction of new media, music is often tied to visual cues, complementing a story created by the screenwriters. Edmund posed the questions: Does popular music stand on its own or does it require a public discourse? Where does the boundary between sound and music begin, if at all? What does musical presence mean for you? Like the final notes of a symphony, these questions are sure to linger in the minds of Berkeley Connect Music students. ← Previous Post Find Your Spring 2018 Berkeley Connect Welcome Event Next Post →Are there blergs?